Mr. Bush and I work very hard. We get up at 6 A.M. and don't get home until 7 P.M. The issue is what we do in between. His day is much like mine, The first thing I do is take 45 minutes to review my emails and respond to the ones I deem necessary. Afterwards I hold a meeting with my lieutenants to review their progress and provide direction where necessary. I then meet with my assistant, review the progress she is making on the projects I assigned her and then I am off to an extremely stressful two hour lunch meeting with two clients that deep down I dispise. Do you realize how draining that can be? Its a good thing I had a squash game afterwards to relieve some tension. Thank God for exercise. When I return to the office the Mayor's aide is waiting for me to discuss our plans for a new office building, which I am leading him on some with a suggestion that we may be leaving the city and we need some concessions if we are to stay. In the meeting I am stressed and disgusted with the Mayor for sending over such a rookie. I will be reconsidering my donation to his campaign this fall. It is times like these I appreciate my view overlooking the Detroit River on the 32nd floor of the Renaissance Center. It relieves the stress from the long hours I put it. Wow, its 6:45 PM iand time to go to my dinner at the Rattlesnake Club. Remind me to draft a memo to Jeb Bush letting him know I support his concept of the American worker putting in more hours on the job. For my friends and I this grueling pace does not stop on weekends. As the CEO of a major company in town I am expected to attend civic functions and entertain other VIPS over the weekend. This Sunday we are hosting a business acquaintance coming in from out of town to hear Jeb Bush speak at a private gathering at the Grosse Pointe Academy. The next day I am the Masters of Ceremony at a private auction. I cannot wait for my two week bear hunting trip in the Rockies coming up at the end of this month. I need a vacation. 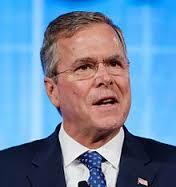 Jeb Bush is right Americans are getting soft and expect everything will be handed to them on a silver platter. Unions are just too strong with the result that productivity in this country is falling. People like the Bush family are living in delusionary view of reality in the working class world. I can't see how they can expect to get the common mankind vote. That's why we have gerrymandering: circumvent the vote of the man in need. It's a form of taxation without representation. The only hope for America is a stong woman of compassion -- Hillary Clinton. It would wise on her part to have as Vice-President that Bernie guy from Vermont. She's got to watch her back, and they sure don't want him as President.